Joe Brutsche came to Battle Creek, MI in 1907 and in 1910, Mr. Brutsche and a friend, Al Humeston, started a concrete burial vault business. The original location was on Kendall St. but soon after, a new building was built out of concrete block that was cast in the initial building. This new location was at 500 Cliff St.
RIn the early years, Joe delivered vaults to the cemeteries in the Battle Creek area with a team of horses whose names were Pat and Mike. Later, around 1915, they were replaced with the business’ first truck, a “Federal.” The first real growth of the business was in 1918, which saw an increased demand for burial vaults due to a major flu epidemic. At this point, the areas of service were still relegated to Battle Creek and its neighboring towns. In 1922, Joe’s son Earl joined the business, which was now known as Joe Brutsche and Son Vault Company. An addition was put on the 10 year old building that year which included more floor space, but more importantly, the first electricity, running water and coal fired boiler were installed. Hard times came for the vault company. Although still growing, the Great Depression came on in the 1930’s and the tough economic times led to difficulty collecting on services rendered. The 1940’s saw the death of Joe Brutsche (1941) and also World War II. Materials used to manufacture vaults were now harder than ever to get because everything was going to the war effort. Much care had to be taken in regards to trucks and other equipment during this time to make sure they lasted until the war was over. Replacements were not available. In 1946, the third generation joined the company - Earl Jr. Over the next 40 years, he grew and diversified the business which is now known as Brutsche Concrete Products. His son, Tim, who is currently the CEO, started working for the business in 1976 and over the years Tim took on more responsibilities until, his father Earl Jr. stepped aside. After being strictly a concrete product manufacturer for many years, 1983 saw the first crematory installed at Brutsche Concrete. Today there are 5 human and 1 pet crematory spread across 3 locations throughout the state of Michigan. This was only a natural progression with the increasing rate at which families are choosing cremation for their loved ones. The fifth generation of Brutsche’s has come into the business over the past few years. Tim’s sons Mickey and Ken, are integral parts of the day-to-day operations. Brutsche Concrete Products has strived to be an industry leader in all forms of service to their customers, but this would not be possible without the dedication of our employees. Over the years, we have been blessed with quality people in all areas of the company who have worked hard in order to grow and preserve the business. Ever since 1910, where 17 burial vaults were sold, to today, Brutsche Concrete Products has grown and served its customers in Southwest Michigan. Brutsche Concrete of MI provides burial vaults and cremation urns to 18 counties in Michigan: Allegan, Barry, Berrien, Branch, Calhoun, Cass, Clinton, Eaton, Hillsdale, Ingham, Ionia, Jackson, Kalamazoo, Lenawee, Livingston, St Joseph, Van Buren and Washtenaw..
A 14x14 tent is set by Brutsche Concrete at the gravesite for funeral services. The tents cover the burial area and provide a comfortable place for families to gather during the funeral. At the end of the funeral, the tent is removed. 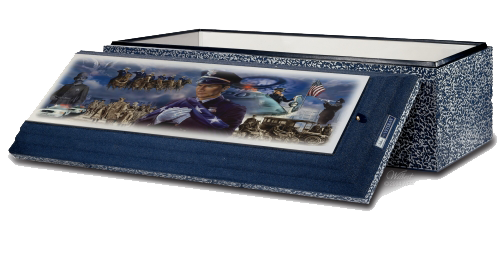 Nameplates give burial vaults a personalized touch. They are a standard feature of Monticello vaults and above. For an extra charge, nameplates can be added to the Monarch grave liners. The nameplate includes the name of the deceased and the birth and death dates..
Brutsche Concrete provides disinterment services. If it becomes necessary to move an interred vault from one location to another, we can assist with these services. We handle everything from locating the vault to relocating the vault to a new location. Pricing is available on request. Vault Transfer is a service available between Wilbert franchises and dealers. Brutsche Concrete utilizes a vault transfer service when a burial request has been made outside of the normal territory. The location of the cemetery is needed to determine the appropriate Wilbert franchise or dealer. Since the services offered by each Wilbert franchise vary, the franchises work together on a per burial basis to determine the services, such as tents, grass, chairs, and grave digging, that each franchise will provide for the burial. Wilbert Funeral Service in Chicago (corporate HQ) has awarded Brutsche Concrete with "Ultimate Service Provider"
There are four service levels: Minimum Service, Basic Service, Premium Service, and Ultimate Service Provider. To be classified as an Ultimate Service Provider, one must receive at least 75 points out of 88 points; a higher score is attainable when bonus points are earned for exceptional achievements. Points are collected by category, including tents, chairs, greens, Wilbert Way, lowering device, vaults, employees, and trucks and delivery. Brutsche Concrete surpassed the 75 points needed to obtain Ultimate Service Provider.